Press Release posted 7/11/13 – San Gabriel Valley Mosquito and Vector Control District vector ecologists confirmed that three dead crows collected last week from the cities of Arcadia and Covina tested positive for West Nile virus (WNv). So far this year, the District has confirmed a total of four WNv infected birds; three from the city of Arcadia and one from the city of Covina. Birds are natural hosts for WNV and are routinely monitored to indicate whether the virus is active in the San Gabriel Valley. Mosquitoes transmit WNv from one bird to another when they bite. People can become infected with WNv if they are bitten by an infected mosquito. West Nile virus threatens the health of San Gabriel Valley residents every year. While the illness is typically not life threatening, approximately one in five will develop disease that results in extended periods of significant fatigue and muscle weakness. People over 50 years of age or with underlying medical conditions are at higher risk for severe illness which requires hospitalization and may lead to permanent disability. District officials hope this information motivates residents to take the necessary precautions against mosquito bites and remove source of standing water sources around their homes. DAWN AND DUSK: Avoid outdoor activity in the early mornings and for several hours after dusk when mosquitoes are most active. DEFEND: Wear effective repellents when outdoors during these times, and ensure doors and windows are properly screened to keep mosquitoes out. Report dead birds and squirrels to the WNV Hotline at (877) WNV-BIRD (877-968-2473) or www.westnile.ca.gov. 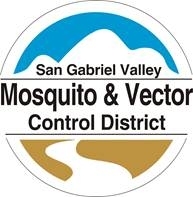 Report mosquito problems to (626) 814-9466 or www.sgvmosquito.org.